Some of our favorite shows to watch at our house are on the Food Network. We especially loved Chopped and, more recently, Cutthroat Kitchen. In this show, four contestants fight to remain in an elimination cooking competition. They’re given money to spend in an auction before each round in which they can purchase ways to sabotage their competitors. They might purchase a rule that prevents all other competitors from using any source of heat during the next round or they could purchase the right to remove ingredients from other chefs’ baskets. In a few of the episodes, one of the sabotages is that a chef can only use a clothes iron to cook their food. It’s pretty amusing to watch the chef frantically try to grill a steak on such a wimpy source of heat. However, some of the chefs do an impressive job of coming up with some very appealing foods. It apparently got my boys thinking and they decided they wanted to start our own monthly family cooking competition with challenges that put their cooking skills to the test. It’s been a tremendously fun (and tasty) way to spend some time together as a family! Give it a try yourselves! Even if your food is an epic failure, you’ll have a fantastic time in the process and some silly memories to laugh about later. Here are fives recipes I found to help us make some seriously yummy food with a clothes iron. Chef on! I’ve always enjoyed a classic PB & J sandwich, but my ultimate favorite sandwich has always been a grilled cheese. With quality aged cheese and whole grain bread, you just can’t go wrong. Apparently not even with an iron! You’ll prepare you sandwich like you would if you were going to cook it on a pan or in the oven by spreading a layer of butter on the bread before loading a good serving of cheese on top. My favorite cheeses are gruyere, super fresh parmesan, and cheese curds from local farmers. My mouth is watering just thinking about the salty creaminess! Once your bread is prepped and loaded, you place a second slice on top and wrap it in tin foil. Then, with a hot iron, you press each side for 5-6 minutes before unwrapping perfection wrapped in foil. You can find more gooey cooking directions here. With our family favorite detailed above, our next sandwich of choice is a good old PB & J (or PB & H(oney) if you’re like my husband). Again, just like you iron-grill a grilled cheese wrapped in aluminum foil, you do the same for this most amazing warm version of a peanut butter and jelly sandwich. 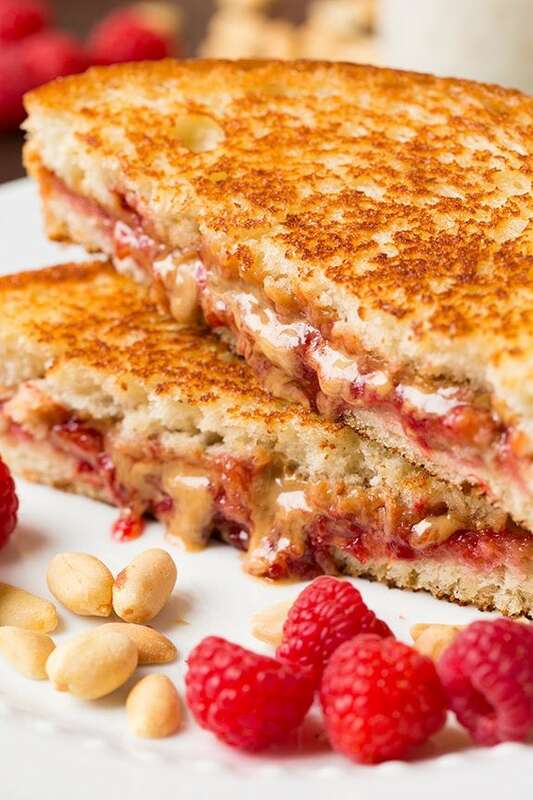 I suggest spreading a thin layer of unsalted butter before you smear the peanut butter and jelly on top. Head over to the Food Network where Tyler Florence shares a fantastic recipe for his PB & J with bananas… a PB & JB, perhaps? I’ve always enjoyed a good scrambled egg now and then and have served them in our home since my boys were little. But then we traveled to London and scrambled eggs took on a whole new meaning! The British use an ingredient that Americans usually haven’t picked up on yet and it’ll have you wanting scrambled eggs every day of the week. So what is this secret ingredient? Creme fraiche! Try this amazing recipe from Gordon Ramsay and have fun cooking it all up on an aluminum foil-covered iron. Watch a full cooking tutorial here. Actually, these pancakes are more like ironcakes. Simply wrap aluminum foil over your iron to create a cooking surface and pour on a small amount of your favorite pancake batter. My boys and I were surprised at how fluffy the ironcakes were! Check out this recipe from Jamie Oliver. Skip the campfire and smoke and go with an iron instead. Create an ultimate melty s’more by wrapping the ingredients in aluminum foil and heating each side for about 3 minutes. Get s’more info here.